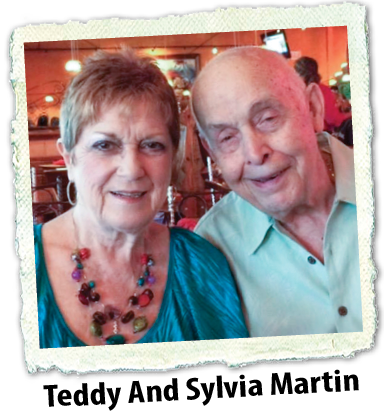 Teddy Martin of Ted’s Bar-B-Q in Huntsville and Madison is celebrating his 85th birthday and 63rd wedding anniversary with Sylvia on June 3rd. Ted is originally from Sheffield, Alabama and his love of food and cooking was inspired by his Mom. In the 1960’s and 70’s he owned and operated two bar-b-q restaurants in the Shoals. Teddy’s sons, David and Danny are proud to have honored him by naming their bar-b-q restaurants Ted’s. Ted enjoys being in the restaurants, visiting with customers and maybe kissing a few babies, which he has been known to do! Ted’s Bar-B-Q is part of a locally owned restaurant group that includes Rosie’s Cantina, Steak-Out, Shaggy’s Burgers and Tacos, Little Rosie’s, Phil Sandoval’s and Walton’s Southern Table. Copyright ©2019 Ted's Bar-B-Q. All Rights Reserved.